Glitter Glue Vampires. Made me laugh =) Glue vampires!. Wallpaper and background images in the Critical Analysis of Twilight club tagged: glitter glue vampires sparkly deviantart twilight critical analysis image. yes! 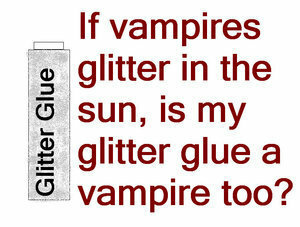 your glitter glue is a vampire!lol! Noooooo not the glitter glue! Stephenie Meyer's" The Short seconde Life of Bree Tanner".